The adage that “PR builds brands and advertising defends them” is truer than ever. More than at any other point in history, people want to know what other people–neutral third parties–think about a company before considering what a company says about itself. Social media has opened the floodgates to third-party recommendations, and journalists, whether bloggers, reporters, or reviewers, hold as much sway as social likes and follows. A thumbs up from a respected publication can give a huge boost to brand awareness and sales. The press release, the most common deliverable companies use to distribute news to journalists, faces more competition these days, not only from other press releases, but from social posts, blogs, direct email, print and digital ads, and more. While any company can put a press release on a wire service and see it gobbled up and regurgitated by hundreds of media outlets, what we all want is real coverage by real journalists that give companies brands authority and credibility. Press releases are typically written by marketing or PR agencies or internal teams and inevitably come to an executive for approval. This blog explains what you should look for in company press releases whether they are produced by an agency or an in-house PR team. The most important part of a successful PR campaign is to start with real news. The importance of this cannot be understated. One of the biggest mistakes we see is new companies, or companies with new products, simply announcing the release of a new product that will disrupt the status quo. Announcing a new company or product and claiming that it will change the world is not news. For more on this, see our post 5 Reasons Your Press Release Doesn’t Get Picked Up. What is the news in your announcement? What problem does your product solve? What type of business or personal benefit does your product enable? Why is that important? Who will be excited about it? Pro Tip: Search the news about the industry you are targeting and see what is being written about–see what writers are honing in on as the newsworthy part of the stories. The timing of announcements can be just as important as the content. Your goal is to become part of the news cycle. If your product is aimed at students, think back-to-school. If it involves outdoors activities, get in the spring news cycle. If it involves relationships, hit the Valentine’s Day cycle. You get the idea. Think about what kinds of stories publications need to produce and send them something that will help a reporter deliver something valuable to their readers. We had a client with a great new 3D camera that they wanted to launch at CES, the world’s largest consumer electronics trade show. It was perfect timing, as 3D headsets and 3D content were the rage. It was a topic that journalists were highly motivated to cover and to find out what’s new. Even though CES is packed with companies selling the stories, we got a lot of coverage because we had a new solution in a hot market. Pro Tip: The National Day Calendar lists all the official “days” that are out there–from National Cuddle-Up Day to National Technology Day. You can even create your own day to tie your product or announcement to current events. The purpose of your press release is to effectively and efficiently convey news to journalists. Don’t use industry insider jargon and abbreviations that people might not understand. It’s an immediate turnoff. Remember how Netflix created an industry and destroyed another with a simple value proposition: “No late charges.” Salesforce’s message was equally simple: “No software.” Neither company talked about the technology behind these benefits in their marketing and PR. Pro Tip: Focus on the pain point that your product addresses–journalists want to know about anything that is going to make their readers’ lives easier. Your goal is to get writers to read more than the headline. If they get past that, this means they are interested. Write a captivating, descriptive headline, sub-headline, and lead to pull people in. A large engineering firm we worked with won an award for a state-of-the-art new water treatment plant. Instead of the customary “We won an award” headline, we wrote the press release like a news story. The headline read: “XYZ City Saves Millions, Improves Water with New Technology.” We provided professional photos of the project and the people involved, great quotes from city leaders, and the story was covered in multiple trade and news publications. Pro Tip: When you send out a press release with photos to journalists, put the press release in the body of the email and link to photos in a cloud-based platform like Google Docs. Harried journalists don’t like to open a lot of attachments. Wire service releases and mass anonymous emails to journalists are increasingly ineffective. Few writers scour wire services for news anymore because they know that the same news is available to every publication in the world. And nothing ticks off a journalist more than getting a mass email or a pitch about a topic they don’t cover. Media databases like Cision, Meltwater, and MuckRack allow you to search for journalists based on beat and/or based on their recent publications. This allows you to find out who is writing about your industry. The databases provide the journalist’s email and phone numbers. They are pricey, however. We’ve reviewed Cision, Meltwater, and MuckRack in our blog. You can find journalists yourself by searching Google News and finding recent stories. Then the challenge is to find email addresses or phone numbers, but it can be done. Pro Tip: Most writers post and promote their work on Twitter. If you can’t find a writer’s email address or phone number, you can usually find his or her Twitter handle and communicate via direct Tweets. Your pitch is the email (or Tweet) that introduces your press release. This is as important as the press release itself. It is critical that the pitch is personal, brief, and focused on what the journalists needs, not what you or your company needs. Don’t brag about the product or company. Instead, ask if the journalist is still covering your industry, summarize the news in the announcement, and introduce yourself as the point person to give the writer anything he or she needs if they would like to cover the story. Pro Tip: Check out Help a Reporter Out (HARO). It’s a service journalists use to find sources for stories. That’s right, the journalists pitch you! See our article on How PR Pros Can Become SuperHAROs. These are the basic elements of a successful press release–it’s part content, and part distribution strategy. Yes, it’s competitive out there, but if you’ve got real news, there are journalists that want to write about it. 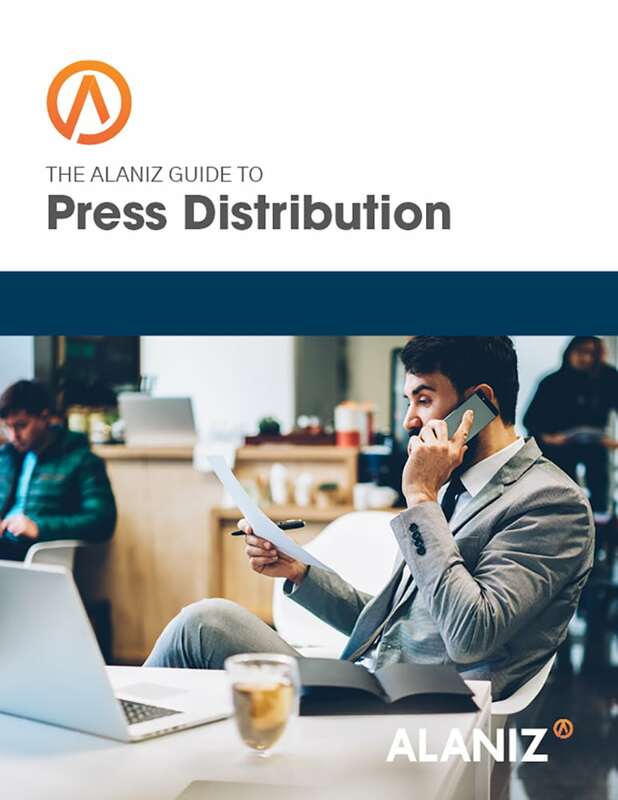 To go deeper into these topics, download the Alaniz Guide to Press Distribution.